Hardcover, 11.75 x 9.25 in. / 88 pgs / 46 color / 29 bw / 6 duotone. 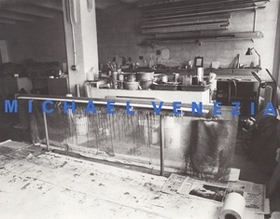 While Michael Venezia never broke from his roots in Abstract Expressionism, this book explores his adaptation of expressionist practices--the significance of the accidental gesture, the poignancy of textured surfaces. Venezia's most recent work has used extremely long, narrow bars as his canvases; these vibrant pieces force a shift in perspective through a spatial manipulation of the viewer. FORMAT: Hardcover, 11.75 x 9.25 in. / 88 pgs / 46 color / 29 b&w / 6 duotone.